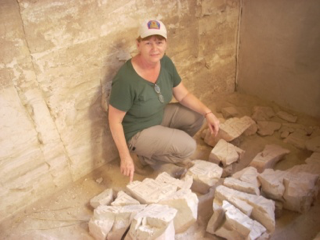 Jan Summers Duffy is an Archaeologist, Curator and Egyptologist who works in Egypt and in the US. Currently with the OJSmith Museum at The College of Idaho, she formerly worked with the New York State Museum as down-state Archaeologist and Collections Manager at historic Iona Island. She has an AAS, BA and MAs. Working at several sites throughout Egypt, including Mendes in the Nile Delta with Penn State excavating burials, she has also worked on tombs in Luxor. Her research is on artifacts from the tomb KV62 and others including the Headrests; (A Pillow for His Head”). She is also discoverer of the salvage site 10AA612, a large obsidian biface funerary cache possibly linked to the Western Burial complex. In New York state as a member of the NYSAA, she helped excavate one of the best known Mastodon sites, Duchess Quarry caves. “Re-use and usurpation defines the tomb of Tutankhamun and its artifacts. The recent theory of hidden rooms in the tomb is realistic. Many believe that Nefertiti is Tutankhamun’s stepmother and may have acted as co-regent to Akhenaten, His father.